On the day of his second State of the Nation speech, the streets around Parliament resembled a scene out of a divided Caracas, the besieged Venezuelan capital. There were more cops deployed around the precinct in a single day than had probably been deployed in the Western Cape’s gangland over a violent Christmas season ever. A wide perimeter of steel kept the people out of their own Parliament. The political elite commandeered the police to protect its pageantry from a threat not immediately clear. 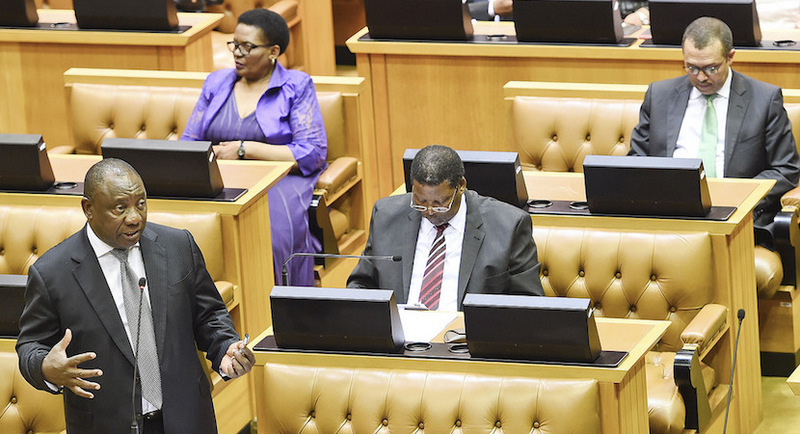 The securitisation of Parliament during the State of the Nation is a sad carry-over from the kleptocratic years of former president Jacob Zuma, when the National Assembly hired goons in white shirts to bounce out the EFF. In this, Ramaphosa revealed a part of his style that is not often chronicled: he is a nerd and a workaholic in the style of former US president Barack Obama. He is bookish as his pages and pages of meticulous but boring accounting to the nation made a diplomat or two sitting near to the media bay fall asleep. The entire house of Parliament, filled to the brim and attentive in an election year, felt kind of sluggish as Ramaphosa entered the second hour of the speech, articulating the minute detail of his ideas and plans to grow an economy stuck below one percentage point growth and which has unemployment levels so high, it’s a feat of governance that South Africa is not at a point of the Venezuelan crisis. There were important promises and ideas but Ramaphosa wrapped it into a bookish and analytical speech. Even big announcements, like a new e-visa regime, the break-up of Eskom into three utilities, the acknowledgement that government will have to take on some more of Eskom’s guarantees for debt and a new Scorpions-like team, did not come across like the big-bang announcements of a populist politician in an election year. While South Africa is a country that is past-centric more than future-focused, it’s clear that Ramaphosa wants to change that tilt. The urgency of governing after the decade lost to kleptocracy, where institutions like SARS, the NPA, the police, Eskom and Transnet were ruined, has meant that Ramaphosa’s must be a presidency of reform. But, near the end of his speech, his nerdish instincts ran loose. Ramaphosa wants tablets in all schools (you might ask what about those without classrooms, electricity, toilets and desks, but that might be churlish) and he wants to pivot the country into the future. “As a young nation,” said Ramaphosa, “only 25 years into our democracy, we are faced with a stark choice. It is a choice between being overtaken by technological change or harnessing it to serve our aspirations. “Unless we adapt, unless we understand the nature of the profound change that is reshaping our world, and unless we readily embrace the opportunities it presents, the promise of our nation’s birth will forever remain unfulfilled,” said Ramaphosa. Then, Ramaphosa extolled the future of “space observation, advanced engineering and super-computing”, all capabilities developed through the Square Kilometre Array. It’s clear that Ramaphosa is interested in state modernisation theory and also in what a fourth industrial revolution may mean. This is a step-change from the Zuma era of plunder and traditionalism into an administration that is almost nerdish (in the better sense of the word) in that which is new and innovative. Can it work? Ramaphosa governs an incapable state with a recalcitrant bureaucracy scared of innovation. The country’s most powerful trade union, the South African Democratic Teachers Union (SADTU), will not even countenance performance assessments, for example, while trade unions allied to Ramaphosa’s ANC have already started mobilising against the break-up of Eskom. At the end of his speech in the final moments of a two-hour-long opus, Ramaphosa acknowledged the country’s divisions and pain: “… we have seen divisions in our society grow. Between black and white, rich and poor, between rural and urban, between the sexes, and between language groups and cultures. Then, the nerd gave way to the statesman. Whereas in 2018 Ramaphosa channelled the jazz statesman Hugh Masekela to summon the spirit of volunteerism in South Africans, this time he looked further afield and used Teddy Roosevelt’s ringing call to citizens, “The Arena,” his most famous speech. To South African naysayers or special interests, Roosevelt’s words boomed through Parliament. “The credit belongs to the (wo)man who is actually in the arena…”. It was Roosevelt’s words which lingered in the air as the crowd dispersed out of Parliament and into the night.